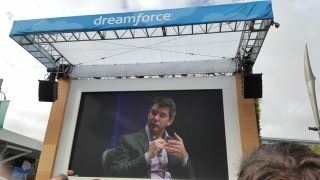 At Dreamforce 2015, Salesforce CEO Marc Benioff sat down with Travis Kalanick, the CEO of Uber, to talk about the ride-sharing company's business model and its vision for a future filled with robots and self-driving cars. Talking about how Uber is not only disrupting the taxi business, a nervous Kalanick lit up when he discussed how his company is changing the world by providing reliable transportation. Uber's principle, Kalanick said, is to always deliver a reliable ride that's high quality and safe. The company accomplishes this through a combination of technology, algorithms and operations. In San Francisco alone, Uber onboards over 1,000s of drivers every week and its operations team helps predict demand. When Benioff asked how demand changes when there is rain, Kalanick responded by saying that the price of an Uber ride increases when demand outstrips supply "so we can be reliable." To help manage demand, Uber uses technology. Drivers use a heat map to find out areas where there is high demand. However, as more drivers target parts of a city with high demand, this removes part of the demand, and what we have left is residual demand. New drivers will use residual demand to figure out where they need to be to generate more income, and the goal is to have drivers pick up customers within five minutes. In a city, taxi drivers can spend as much as $140,000 a year renting a license and car to operate a taxicab. For that money, Kalanick said, they should be driving a Bentley. This is where Uber comes in. Kalanick said that Uber serves a purpose to fill the gap because the taxi system is broken. Drivers benefit with cheaper upstart costs and passengers benefit with rides that are up to 40% cheaper, at least in the city of San Francisco. When Uber started, Kalanick focused on the high end of the market, offering black car rides. He ran some numbers and began cold calling limousine companies pitching that he can help them make up to 50% more income each week. About one-third of those companies were interested, and his business partners found that drivers were even more interested in the mobility that Uber affords. Each Uber product, spanning Uber Black to Uber Pool, operates on three premises. The first is that the service must deliver convenience to customers. The second is that the service should be affordably priced, and Kalanick said that Uber has to inject a certain amount of magic as the third principle. With Uber Pool, the product isn't quite as profitable as other Uber products, but Kalanick said it offers the same amount of convenience at a much more affordable cost to riders. The product is part of a broader vision to reduce the number of cars on the road. First, Uber Pool makes it more affordable than owning a car, and second, if more people ride Uber Pool, the service would reduce congestion on city roads. Currently there are over 100,000 people in each city every week riding Uber Pool, and over 50% of the rides that Uber provides in San Francisco is now an Uber Pool. Uber delivers about 1,000 rides per minute on average. Kalanick said that the goal of Uber is to provide transportation for everyone and everything everywhere. This is a broad vision, as Benioff jokingly said that every car will become an Uber. The goal allows Uber to expand into new areas of service to grow the business, including delivering food, groceries and packages within a city. This is different from a service like UPS, which Kalanick said is good for long distance deliveries. As this happen, Kalanick predicts that city commuters will regain an hour of their day back, time that would otherwise be lost in traffic. And transportation everywhere means not just the big cities for Uber, but also in rural areas and in remote places where finding a ride may not be easily accessible. But Uber isn't stopping there. Despite its business model's reliance on drivers, Uber is ready and willing to accept a future with driverless cars. "We're a technology company," Kalanick proclaimed. "We embrace the future." Citing that 30,000 people die every year in the US from a car accident, Kalanick said that driverless cars are safer than human drivers on the road. Additionally, with algorithms, connected vehicles can route drivers efficiently to eliminate traffic. Kalanick wouldn't say when this future would happen, but he wants Uber to help with the transition. For Uber's business, it would mean that human drivers may eventually lose their jobs, but Kalanick said that the beauty of technology allows us to reinvent, create new expertises and jobs and continue to disrupt. The worst thing for Kalanick and Uber would be to be resist change, to essentially become the taxi companies that Uber is displacing by not embracing technology.